LOS ANGELES, California, November 20, 2015 (ENS) – The Next-Generation 2016 Chevrolet Volt was given the Green Car of the Year title by the “Green Car Journal” Thursday during Press Day at the Los Angeles Auto Show. The other finalists were the Audi A3 e-tron, Honda Civic, Hyundai Sonata and Toyota Prius. 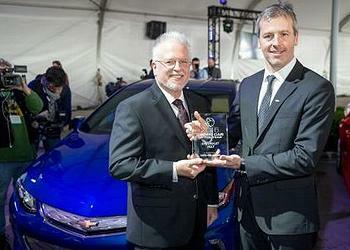 This is the second time the Volt has won the award. 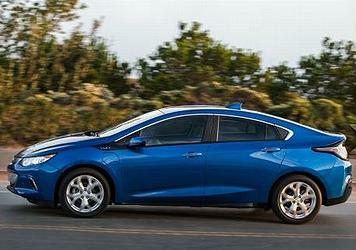 The Volt also won when it debuted in 2010 as a 2011 model. The Green Car of the Year award is determined by an 11-member panel and is based on fuel efficiency, certifications by the U.S. Environmental Protection Agency and the California Air Resources Board, performance and affordability. “Chevrolet’s all-new Volt is a milestone, building on an already-technologically advanced green car and delivering what buyers have longed for, including an impressive 53-mile driving range on a single charge,” said Ron Cogan, editor and publisher of “Green Car Journal” and CarsOfChange.com. “A visually appealing design, increased five-passenger seating, and an array of on-board electronics combine with the Volt’s inherent efficiencies to make the 2016 Chevrolet Volt a real winner,” Cogan said. The 2016 Volt delivers a total driving range of up to 420 miles. Combined with EPA-estimated fuel economy of 42 mpg highway, Chevrolet expects owners to travel 1,000 miles between gasoline fill-ups. Opening to the public today, the Los Angeles Auto Show features a first-of-its-kind competition among teams of globally recognized entertainment and consumer brands, international automotive manufacturers and industry-leading software developers to reimagine the auto industry. The competition, “Autonomous Vehicles: A Redefined User Experience for 2050,” comes in response to the rise in technology’s influence on the automotive industry as self-driving vehicles take center stage. The competition is an evolution of the 11-year-old annual Design Challenge, which has been the only OEM auto design studio competition in the world. The participants in this new Design and Developer Challenge are asked to envision how technology, data, connectivity and content will revolutionize modern vehicle design. Following the kick-off, each design studio/entertainment brand team will meet with developers to cultivate the features of their concepts and bring to life each aspect in the form of storyboards/illustrations for the developer to create into an interactive experience to be presented at the 2016 Los Angeles Auto Show. Individual brands and design studios participating include: Activision, CH Auto, Crayola, DreamWorks, General Motors, Honda R&D Americas, Hyundai Design North America, KTM, Legendary, LEGO Future Lab, Hot Wheels, National Geographic, Qoros Auto, SAIC and Toyota Motor Sales. “Developing content and experiences for the connected car today, and envisioning the role content plays in the autonomous car experience of the future, is already underway at DreamWorks Animation,” said Jim Mainard, head of digital strategy and new business development at DreamWorks Animation.